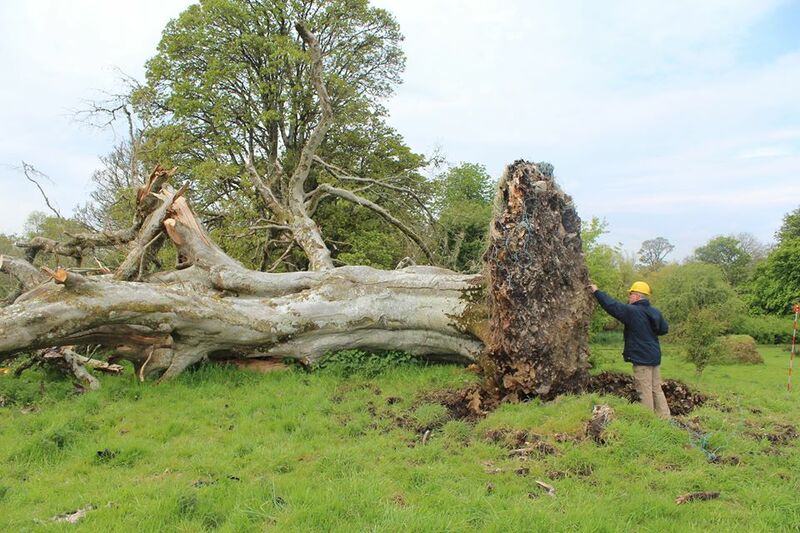 This week in Ireland, a 1000 year old skeleton was ripped unceremoniously from the ground when the tree in whose roots the skeleton was tangled blew over in a storm. Locals found half of a young man dangling in the uptorn roots following the big blow. (Source: Irisharchaeology.ie) While the youth of this tree seems to indicate it was grown some 800 years after the man’s death (assuming the bones people and the tree ring people were all talking nicely to each other), it has reminded me of one of the most intriguine elements of my research… The practice of ‘seeding’ a corpse. One of the earliest formal references to the practice of ‘seeding’ comes from the 13th Century compilation of much older tales called Aurea Legenda (the Golden Legend) by Jacobus de Vorgaine. The story goes that Adam (fearing the end of his life) sent his son, Seth, to the Garden of Eden (from whence he had been expelled) to ask the attending Angel for the Oil of Mercy which had been promised by God. Seth found his way there but the Angel refused him the oil. Instead, it gave Seth three seeds from the Tree of Life (aka Tree of Knowledge) and Seth returned home with these safely tucked away. Despite the fact that the Angel had not shown him mercy, Adam was ecstatic to see the seeds and expired days later, and his family buried him—as instructed by the Angel—with all three holy seeds under his tongue. A sapling sprouted from his corpse and grew (fed by ‘the blood of Adam’) into a three-trunked tree. Later, Noah dug up this tree by its roots (including Adam’s skeleton) and carried it on the long Ark journey, extracted Adam’s skull from the roots and buried them atop Mt Calvary before finally re-planting the tree on the summit of Mt Lebanon. In this tale, the surviving tree or its timber go on to be integral in many biblical tales and finally come to rest back atop Mt Calvary (reunited with Adam’s skull) as the upright in the cross on which Jesus of Nazarath was crucified. Quite separate to loving the idea of a saga told from the point of view of a tree (mental note to self for future story…), and ignoring for the moment that they don’t seem to have grasped how much of a solid the Angel has done them by giving them not one but three seeds from which to grow their own Trees of Life (which presumably exudes the Oil of Mercy and thereby demonstrates the whole ‘teach a man to fish’ principle) the fact that a pre-Christian tale such as this so effortlessly describes the practice of ‘seeding’ suggests to me that it was reasonably common. At least it was from then on. When I was researching the GreenMan phenomenon (more here) I came across a compelling but half-buried theory by a historian/author (who—to my endless regret—I did not notate at the time and so cannot find again whenever I need it…which seems to be distressingly often). His theory attributes pre-Christian pagans with the practice of seeding the dead as described in the Aurea Legenda, and suggested that this practice is behind the high incidence of recognition of the GreenMan image across multiple cultures and the similarities in incarnation of that imagery—namely that the resulting foliage bursting forth from a corpse’s orifice is what ‘seeded’ (pardon the pun) the GreenMan imagery across so many cultures. The pagan practice resonated deeply with me (and seems so plausible in a tree-centric culture like the Celts) that I used it in y Ddraig, giving the Mathrafal people of Cymry the habit of laying out their dead without interment (*) but placing seeds under their tongues to grow tall on the corpse’s dying remains. In the case of y Ddraig I extended the practice to include dragons who are the reason tree (and stone) circles exist today. In Cymry, seeding a person—or a dragon—is the highest honour. Anglo-saxon (Germanic), Norman and Danish words dominate the language we know as ‘English’ but there are a number of ‘Welsh’ words that survived through to modern English. ‘Wales’ itself gets no points because it’s not a Welsh word (it’s a Anglo-saxon phrase) but ‘Cymru’ has endured for far longer than any of the Anglo-saxon words. The word ‘bard’ applied to a singer or a poet like Shakespeare comes from the Welsh word for storyteller/poet bard. One that surprised me was ‘dad’ – it comes from the Welsh Tad (meaning father). Interestingly the old English word for the person who sired you was Faeder. But ‘Dad’ has made it into the very common English vernacular as an intimate form of ‘father’. Eisteddfod is the least English word to have survived into English. It comes directly from the Welsh and literally means ‘seated be’ (sedd = seat, bod = be). In the earliest year of Welsh society, the people of Cymry came together to share stories, poems and hear songs from bards and they all sat around a fire and listened to the songs. Today, Eisteddfod is an annual celebration of music and storytelling. ‘Flannel’ is believed to come from the Welsh gwlanen (meaning ‘little wool’) is likely. The original word was ‘flannen’. The Celtic spectrum different to ours. Theirs was based on and described by the quality of the hue, not the wavelength. Thus, the early Welsh ‘llywd’ can mean brown (like paper), blue (like mould) or grey (like rabbit) because they are of similar hue not colour. Similarly, ‘glas’ can mean grey (like a horse) or clear (like saliva). ‘Coch’ means brown (sugar) or red (meat). This spectrum trend is also found in the traditions of Scotland. Typically, going back to the earliest naming conventions of Wales/Cymru names had very formal structures but weren’t simply limited to patronyms. Individuals had a given name followed by a byname. Patronyms (ie: being named for your father) were, of course, the most common with an estimated 50% of ye old Welsh names being “ap/ab” (‘son of’) or “verch” (‘daughter of’) or more rarely “Wreic or Uxor” (‘wife of’). The name Gwendolyn Beynon is a patronym because way back the phrase ab Eynon evolved to simply Beynon. Centuries later I inherited it. Essentially something is a Patronym if your identity is qualified by your father’s (or sometimes your husband). About half as common (25%) were the people named for some notable descriptive feature—the bright colour of their hair (Gwyn Goch), the length of their legs (Cai Hir), the size of their beard (Cynyr Forkbeard), the prominence of their teeth (Arwyn Fangtooth), their temprement (Ewan the Bull or Ewan the Impetuous). A few (10%) were named for their occupation. In the middle ages a word for ‘Huntsman’ was Cynydd (Kennith) and a word for a singer or bard was Cantor. Very few (less than 1%) were named by their place of birth – Ewan ab Einion. Okay so that quote is about a thousand years out but it’s as good an intro as any into the subject of medieval horsery. Horses were central to lower and upper middle age society being important for transport, agriculture and (later) warfare. While we differentiate modern horses by breed, back then they were differentiated by purpose – war horse, cart horse, pack horse, riding horse. Over time those ‘purposes’ also led to breed differentiation but at the time that I set ‘Sacrifice’ a horse was just a horse (of course, of course….). There were no ‘war horses’ in the Dark Ages (early middle ages). Warriors rode to battle as a matter of convenience and speed but rarely into battle and they wouldn’t have wasted healthy mounts by using them as mobile weapons the way horses were used as living-rammers in later parts of history. Warfare was conducted on foot. Dark Age horses were primarily for transport, labour, hunting or food. There were no stirrups until (roughly) the 8th century. Prior to the 700s, riders used their knees and backs for balance while mounted and hurled themselves easily up onto the saddle (or pad) using inertia in lieu of stirrups. Necessarily, the most popular horses were those with the most comfortable riding gaits. The first clear, written evidence of the existence of horseshoes (as we know them) was a 10th century comment about ‘crescent shaped irons and their nails’ in a list of military equipment. Pre-Christian references to the virtues of hard hoofs abound (and it seems like exactly the sort of thing the talented smiths of the Celt society would have had covered given their equal passion for iron and horses) but actual evidence is scant and horseshoes found in roman ruins etc are now believed to have been off-casts from much later in history when looters ravaged the historical sites. Scholars therefore place the creation of the contemporary(esque) horseshoe between the 6th and 10th century. So if your 4th century tapestry shows a rider with stirrups or a blacksmith changing a horseshoe it’s probably a fake. The average horse in the Dark Ages (early middle ages) was around 12-14 hands (140-150cm), that’s roughly a kids’ pony today from hoof to shoulder. A ‘great beast’ by their standards would appear just a normal height horse to us. Necessarily, taller warriors and kings looked a little ridiculous by modern standards, apparently riding a child’s pony. On the upside they were easier to get on sans stirrups…. The Celts worshipped the horse goddess Epona particularly and they were outstanding craftsmen of metal horse ‘tackle’ (bridles, saddles, spurs, decorations) as well as chariots/carts. It is believed that the Romans picked up their use of chariots from the Celts. Celtic warrior chieftains were often buried with their horses and chariots in much the same way the Vikings were buried with their boats. It is interesting to note that ‘tack’ hasn’t really changed in the 2000+ years since the Celts first smithed them. Bridles, bits and the decorative fixings that go with them have barely changed in all that time. Only spurs have changed and they’ve become shorter. The Celts were both stunning artists with metal and great lovers of the horse. There were no geldings in the middle ages. Mares were most common for every day riding or pack work and stallions were used as war-horses due to their natural aggression and hot-blooded tendencies. The average medieval knight was expected to ‘keep’ one super-skilled war-horse (stallion) and around five riding/pack horses (mares). 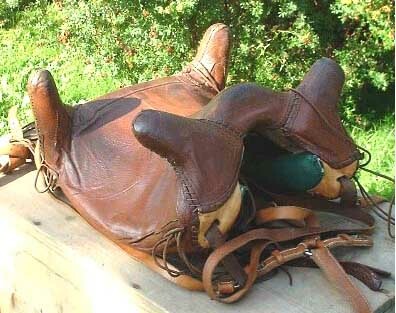 Dark Age saddles were either a pad tethered to the horse by (girth)straps or resembled the Roman four-horned saddle below. A solid ‘tree’ raised the rider above the horses back (for its comfort) and distributed the weight either side of its spine. The four horns made riding more secure for the rider without a stirrup. This also helped by giving a little extra height to long-legged warriors mounted on short-legged horses. The horse breeds that existed in the Dark Ages are all now extinct. Still, the hardy modern breeds like Welsh Cobs and Fell Ponies are somewhat close to the tough little horses that were popular in (and suited to) Dark Age Brython. The quality horse breeding that was done on the Continent in classical times was lost along with so much other culture in the post-Roman period when uncontrolled (cross)breeding diluted the bloodlines. Of the bigger war-horses of the later middle ages, the closest modern cognates are Friesian, Andalusian, Nisaen, Percheron, Suffolk Punch, or Belgian. Destriers were well-trained, strong, fast & agile. That combination of skills was uncommon, and most suited to the joust (or charging in actual battle). Courser – light, fast, strong good for hard battle. Valuable but not as costly/showy as a Destrier. Also used for hunting. Rouncey – riding horse for squires, men at arms, poor knights. Sometimes used as pack-horse but never as cart-horses. Palfrey – could equal a Destrier in price if well bred. Popular with nobles and knights for riding, hunting and ceremonial use. Prized for their ‘ambling’ gait (smooth and could cover long distances quickly and in comfort). Jennet – small horse from Spain, quiet and dependable, ladies horse, used as cavalry in Spain. Gaits in the middle ages were: Walk, amble, jog (trot) & gallop An ‘amble’ is faster than walk and less bouncy than a jog (trot) but slower than the modern canter. It can be sustained for a long time and was particularly good for endurance. Sitting comfortably in trot/jog (without stirrups) required well-conditioned back and abdominal muscles and so was tiring after a while. An amble was much easier on the rider. Foreign breeds selected for their natural amble were very popular. The (Spanish) Jennets were talented natural amblers and very popular (as they were with the mounted infantry of their country of origin). The video below shows the natural, smooth amble in a US ambling contest. The ‘Green Man’ is a symbol found in many ancient cultures dating back to 3000BC (and still used today). A visual Green Man is usually timber- or stone-carved face covered in foliage which often emanates from the figure’s nose and mouth. It is not always a male face, nor indeed always human. You can find Green Man all over Great Britain and Europe but also North Africa and parts of Asia representing fertility and rebirth, the cycle of life. In some cultures he is a visual representation of the ‘ashes to ashes’ concept or some spiritual union with nature. He has crept his way into more contemporary cultural events and is appearing courtesy of neopagans carved into the trunks of trees he once hid amongst. Green men can often be found in very old churches or cathedrals where they are carved in amongst all the Christian symbols. Were these subversive inclusions on the part of the carvers or was it evidence of the early church’s tolerance for old ways in amongst the new? Certainly there was no shortage of people amongst the earliest post-Christian societies who kept up with the old gods, too, just in case. Perhaps it pleased the earliest Christians to sit in church under the watchful eye of much older Gods than they now bowed to. There are several kinds of Green Men and the easist to identify as a lay person are what are called the ‘disgorgers’ – the ones with foliage very obviously growing from their facial orifices. The next most obvious are the ‘foliate faces’ where the human appearance is made up of cleverly carved foliage. Next most common are the ‘peepers’ which peak through or out of foliage but aren’t made from it. And lastly the ‘leaf masks’ which are often the oldest and least ornate and are simple faces made from just one or two leaves. It is not hard to see a connection in the visual Green Man between mankind and nature. Once—before the evolution of iron which allowed the axes that felled them—most of Britain was covered in thick forest and mankind lived there amongst its other creatures in comparative balance. Green Man stands as silent reminder of what we have forgotten. I have used the Green Man in y Ddraig, giving the ancient people of Cymry (the Mathrafal) the habit of laying out their dead without interment but placing seeds under their tongues to grow tall on the corpse’s decaying remains and emerge through any of their cranial cavities. Similarly, they wedge yew seeds along the length of a dead dragon to honour it. And when the time for flying was at an end, they came to a Dragon’s Rest—somewhere like this—to exercise the bellows of their great lungs for the final time, leaving this world as they liked to sleep, with their tail gently and reassuringly grasped in their great mouth. The first people wedged yew seeds under the dragon’s scales at tail-tip-mid-and-top, wither, shoulder, horn and muzzle and then left the creature to its unending rest. They were the reason the Mathrafal now seeded their dead, though never with Yew. Yew seeds took two years to spring to life, just about the same time as a fully-grown dragon took to return to earth. Of course, the greater the dragon, the greater the resulting tree circle. Melangell glanced around at the large clearing. This ancient mother must have been magnificent. While our lives are saturated with them today, the vast majority of people in the dark ages would never in their lives see a visual image–a painting, a sketch, a statue, possibly not even a map. Just as we use stories and films and computer games today to spark our imaginations or experience another world, so the people of the dark ages felt about the songs/poems they heard. The stories and worlds created by their poets would have served to engage and inspire and capture dark age imaginations. Those with power, money or influence used it to commission bards to create favourable stories about their exploits (or unfavourable ones about their enemies in the dark age equivalent of trolling or political campaigning). While bards were commissioned to peddle certain tales, they still had plenty of capacity to tell other, more traditional and popular tales on the side. Thus, bards would travel the countryside performing epic works of poetry/music that was part entertainment, part current affairs and part advertising. A well-crafted and delivered tale could make or break a powerful family as it spread across the land. As individuals fell in or out of favour the oral references to them would shift, subtly, and change community attitudes as they went. Equity – all the information of the day was shared orally (announcements, politics, laws, campaigning and propaganda, lobbying, entertainment). Because there was no written record (and even if there was almost no-one could read it) information was transient and easily changed but it was totally equitable to anyone who could hear. When general day-to-day information was more immediately accessible by the population, written texts became the language of knowledge/education and a sign of power/wealth, their contents grew in size, meaning and importance. Team sport. There was almost no point in being sung a poem all by yourself. Part of the pleasure of hearing the latest poems/songs was to do it in the company of others with food and liquor. It was a festival. A performance. Exciting treat. Solo act. Reading a text/book is not a group experience. A book is enjoyed privately and intimately. Relied heavily on rhyme. This helped the listener with comprehension and recall, and aided the performer with recitation without missing parts. Early ‘stories’ were songs or poems more than tales. Development of Prose designed to be read in ones head, not recited. Evolution The stories evolved (much like theatrical performance) and could be tweaked by the Bard to suit the audience. This meant content was never secure. The written word rarely changed. The story was reliably the same every time you read it. This provided content surety for the authors. Repetition – Structurally a lot of repetition was used (with content and phrases) to aid in the recitation and to consolidate the story in the audience’s mind and link connected episodes together. Content was freer of the need for repetition (except for effect) because the reader could read the line or passage a number of times to ensure comprehension. Led to more flowery/evocative phrasing. Episodic – individual tales were grouped into epic tales which could be told across the space of a weeklong festival or mixed up and presented like a cycle to keep it fresh. Episodes eventually became scenes and chapters in one big story rather than individual stories collated into a volume like an anthology. Metre – designed to be performed aloud with musical accompaniment, and to create atmosphere. Optimised for the language of the region/listener. Flowery, evocative language. Designed to be read in silence. Optimised for the author’s language. Visually beautiful book artifacts. Anticipation – The audience knew the story or recognised the tradition of a new story and would listen with bated breath waiting for the best bits to come. This meant the bard’s craft was of ultimate importance and he bent and twisted the tale to evoke the most response. Reveal – modern literature relies more heavily on visual imagery and the slow revel of an unfamiliar story for impact/effect. In naming my hero from book three in the y Ddraig series, Lailocen (the Myrddyn), I went back to a range of old Celto-Cymric legends. The ‘Merlin’ as he is most commonly recognised today was a collective evolution of a dozen authors across time and none of them close to the early middle age period that they are believed to originate. The ‘Merlin’ of the oldest known documents (pre Geoffrey of Monmouth) wasn’t a wizard, nor confidante to a King (Arthur or otherwise)–he was a man who went mad from grief following a battle, lived feral for a time and came out of it with the gift of sight. The Black Book of Carmarthen, penned in the mid 13th century and believed to be a written collection of much earlier oral tradition tales speaks directly of several figures we recognise from the Arthurian panethon. Cai (who is portrayed as virtually peerless in battle), Bedwyr (a mighty slayer) and, most notably, Myrddin (Merlin) as a wild man of the woods. In the Black Book, Myrddin has fled into the Caledonian forest (Coed Celyddon) following a traumatic battle and there spends time living crazy and wild until regaining his senses and, with it, a new ability as a seer. In Scots tradition, the same story is attributed to a man called Lailoken (or Laleocen in the ‘Life of St Kentigern’) rather than Myrddin and some scholars insist that Scotland’s was the earlier tale. Show me any oral tale that doesn’t stretch and warp with time and endless retelling and tweaking. Show me any poet or bard, reliant on the satisfaction of his audiences for the food in his belly, that wouldn’t lend his stories a whole lot of local cultural bias and relevance as he travelled the land. This would easily have included names and dialect specific phrases. But of course there was no Scotland then, nor no Wales. The land and peoples known as Cymry (or Brython immediately before it) spread all through that part of modern day Britain. So the Lailoken figure wasn’t Scotland’s or Wales’. It was likely Scotland’s AND Wales’. And a good chunk of England’s. It was a tale of the same peoples and society. And it was told across Cymry. In fact, the stories might be even older. The character from Irish/Gaelic lore, Suibhne, has characteristics in common with Myrddin. He too goes mad after a viscious battle and becomes a wild man of the woods, living in Yew trees as he goes. So perhaps the origin tale is more broadly Celtic and much older than the dark ages. But what we are left with is the same man/tale described in Welsh lore as ‘Myrddin Wyltt’ (Wild Merlin), in Scots as Lailoken and in Irish as Suibhne. In the 15th C a traditional tale speaks of Lailoken and adds ‘some say he was called Merlynum’. So by the 1400s the interchangabiliyt of Merlin and Lailoken was established. Similarly, in the pre-12th C poem ‘The Conversation of Merlin and his Sister Gwendydd’ his sister refers to Myrddin as Llallawg (pron. roughly Lahlooc) and its diminuative Llallogan (pron. roughly Lah-lohgan). In ‘Ascension’ and ‘Myrddyn’ I have used Lailocen/Llallogan as the name of one of multiple Myrddyns existing in the y Ddraig world. Did ‘The Hobbit’ come from ‘The Mabinogion’? J.R.R Tolkien was a card-carrying fan of all things Welsh. He loved the country, he loved the language, he loved the literature and became somewhat of an expert in it even busying himself working on both translations and his own epic Arthurian poetry created in the style of the Welsh bardds. At the same time he was unhappy with the way that scribes and bards of the middle ages had taken the earliest oral traditions and re-assembled them in ways that he felt were deeply flawed. Like ‘reassembling a stained glass window without design’ he is quoted as writing. So the great respect and curiosity he held for the essence and themes of the stories did not extend to the middle age rendering of either scribe or bard. But it was only as I was reviewing The Mabinogion for research on y Ddraig that I noticed the emergence of some very familiar themes in one of its stories. The Mabinogion was translated into English by Lady Charlotte Guest from much older Welsh texts which, themselves, were written captures of vastly older oral tradition. Authors Shippey and Day have already pointed out the similarities between Tolkien’s “The Tale of Beren & Luthien” (from his novel the Simarillion) with the story of Culhwch & Olwen from The Mabinogion. I was looking at a different set of characters to Culhwch & Olwen. I was looking at Peredur (son of Evrawc) in the tales featured in the source document The Red Book of Hergest. No question Tolkien would have been familiar with the story of Peredur from his own extensive study. But can we deduce that he has pared back either tale back to its essential human themes and then used them in new contexts in his own writing? The source document for the Peredur tale is the Red Book of Hergest which is a document used as source material for a great deal of later writing by all kinds of authors. It is known that this is the book he had in mind when he created his own fictional book the ‘Red Book of Westmarch’ a fictional source from which hobbit-lore arose. So he knew the Red Book and almost certainly the stories within, and he knew them well. Like all Welsh tales—grouped, presumably, to aid in the recall/retelling by bards and in the comprehension by listeners—the story of Peredur is a long sequence of adventures (and misadventures) suffered by a young man out adventuring in the wilds of Wales. Amongst many adventures, he suffers one in particular which gives us three themes that are intriguingly common to the modern reader. Out travelling unfamiliar lands, gentle and ill-equipped Peredur comes across a shabby little house in the middle of nowhere made poor by the greed of a ‘serpent’ which is curled around a golden ring and maintains a seven mile exclusion zone to keep people at bay. For no explained reason (perhaps simply because it was deemed heroic to middle age audiences) Peredur battles the dragon serpent violently and desperately, wins, and takes the ring. Subsequently he is then overcome with ‘extreme longing’ for the things he values most and loses both condition and colour in their wanting. An ill-equipped man out questing on adventures unknown whose bravery and courage grows across the story. A ring, guarded by a nasty, desperate, creature. A man subsequently filled with longing/avarice after taking the ring. Drained of his vigour and colour. A dragon archetype, hoarding treasure. All these themes are strong in his famous works, The Hobbit and (later) The Lord of the Rings. In fact, now that I’ve realised what a massive critical studier of Welsh literature Tolkien was, both books make so much more sense. I was always vaguely annoyed at the processive nature of one adventure after the other but, looking at it now with my Welsh goggles on, it is clearly modelled in the style of bardic tradition. Long, epic, progressive tales that grew as new adventures were added. I like it all the more for it. This phrase is still fairly well used — ‘waxing poetic’ in the US and ‘waxing lyrical’ in most other English languages. The fact that waxing lyrical and waxing poetic both exist and are deemed interchangeable makes me think it is related to the bardic tradition. Both phrases are used when someone grows particularly loquacious and flowery in their communication and nothing summarises the role of a bard quite as well as loquacious communication. A bard’s job was to sing the history and politics of his people to the accompaniment of a lyre or lute and to ‘sell it’ with engaging, inspiring eloquence. They were called poets though their works were seldom written down and everything was done verbally. But in the same way that it is the job of poetry to capture or comment on an aspect of human nature, so bards captured and commented with their poems set to music. ‘Wax’ is from an Indo-European word meaning ‘to increase’ or ‘to grow’. So the bright half of the month is known as the ‘waxing moon’ when it starts to fill out and grow. The latin lyricus (from which lyrical comes) means ‘of or for the lyre’ so this was something to be communicated on a lyre. So while (later) poetry came to be spoken and written, back in the day it was sung to a listening audience and composed with the same rigorous structural and cultural traditions as other poetical forms. So ‘waxing lyrical’ means you grow poetic and over-the-top in your language and perhaps it was meant to imply that you have grown as loquacious as a bard whose very survival relied on their ability to sing a fantastic and evocative tale.